I took my dogs to a dog swimming event today. I've always loved swimming and I love dogs so it was a win win situation for me. About 30 minutes into our swimming, a group of dogs appeared and I noticed that one dog had 3 legs. 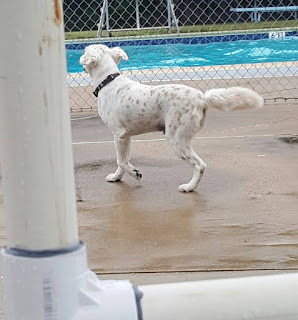 My first instinct was to feel sorry for the dog but as I watched her run around and play and swim, I soon realized that sympathy was not in order because this dog was not missing out a beat! I began to think about how people will let their flaws or imperfections govern their actions even quite possibly missing out on all the fun simply because they look different or feel insecure. I'm at a point in my life where I put on a swimsuit, hop in and have fun! I don't want to sit on the sidelines and miss out on memories because I'm worried about what I look like to people who don't even matter!